The stainless steel Tongue Cleaner (also known as a Tongue Scrapper or Tongue Brush) is most inexpensive solution to keep bad breath away unless one has a medical condition. It removes bacteria from the tongue surface. This product is recommended by dentists and only cost less than 1/3 of a cent per day. It only takes 10 seconds to use and maintenance free. She answered questions in a recent online chat. Here is an edited excerpt. Q: One of my 2-year-old girls (twins) refuses to brush her teeth. We’ve tried multiple brush types, “You brush Mommy’s teeth, and she’ll brush yours,” modeling behavior, praise and more, and little seems to work. I’m concerned about her oral health, and it’s making bedtime a bit of a nightmare. Any tips from you or other readers? A: Give this a rest for a bit. I know, you are afraid her teeth will rot, but at this point, you are just fighting and fighting and fighting, and it isn’t working. 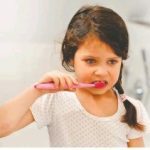 Adopt an attitude of “I love brushing my teeth” and happily brush away (your own teeth). Sing songs and really enjoy it. Let her watch this joy and say nothing about her brushing her teeth. If she wants to, you just say, “Awesome, let’s do it.” No fanfare. Be cool. We are relying on the 2-year-old to want to be like you. That’s what 2-year-olds are like. Be confident she will get there. Coming up Lonka Achaara by ….